This election remains about the genuine struggles and solutions that benefit all but the most privileged in this country. The news of Mitt Romney’s remarks at a closed-door fundraiser that were leaked by Mother Jones has been dominating since it broke yesterday. The scandalous content appears plentiful enough to keep pundits and political junkies glued to Twitter for the remainder of the cycle. And let’s be clear: between Romney’s callous “wait-and see” approach to the Middle East peace process, his instrumental view of Latino voters and his parasitic characterization of those who are too poor to pay income tax, he painted a devastating picture of himself as a leader and a person. The line from the video that is the source of the most fascination is when Romney claims that he cares not at all for the 47 percent of Americans who pay no income taxes and freeload off the government, since they are sure to be Obama voters anyway. The statement is a window into the cynical and meanspirited worldview that would guide this candidate’s policies and priorities were he to win in November. This alone should give every voter pause, regardless of partisan affiliation. Dammit!I’m just now seeing these Romney secret videos. We need that guy on the campaign trail! A year ago this week, a small band of committed activists achieved a goal that had eluded the established political organizations and the progressive nonprofit sector: they successfully shifted the national conversation away from one about cuts and austerity to one about our nation’s yawning economic inequality. “The 99 percent versus the 1 percent” became the rallying cry for an reinvigorated movement, and Occupy Wall Street ushered in a new era where political fantasy gave way to economic reality in shaping the public discourse. While the glory days of Occupy faded with winter, the movement left an indelible imprint on our collective consciousness: despite partisan claims to the contrary, most residents in this country have far more in common than we have that drives us apart. Panicked by the need to respond to the growing sense of outrage about a rigged system built by some of their architects, right-wing leaders cast about for a way to change the conversation back to their own advantage. It was this desire that drove Erick Erickson to start the “53 percent movement.” In launching his campaign, Erickson called the protesters “whiners,” and sought a new social division—one that pitted the 53 percent of Americans who pay federal income taxes against those he claimed were “free-loading” activists. Despite his entreaties and the cheerleading of the right-wing echo chamber, their manufactured meme could not compete with the much more resonant, organic and accurate 99 percent rallying cry. Still, the mathematical and rhetorical trick has remained in the back pocket of a GOP desperate to change the subject back to their hobbyhorse of the deficit. They see their opportunity in the resurrection of the 47 percent argument, despite how the moment presented itself. 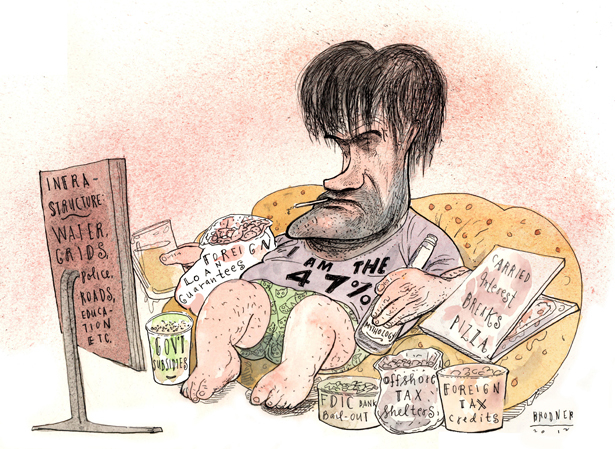 There is now, as there was then, much to take issue with in the 47 percent statistic. Those 47 percent of Americans live below the poverty or are unemployed or are elderly, many of whom have paid taxes their entire life. Those 47 percent also almost certainly pay some form of taxes: be it payroll taxes, income taxes, state taxes, property tax or sales tax. And there is emerging an even more in-the-weeds debate about whether or not these 47 percent are actually more likely to vote for Romney or Obama, an answer we’ll never find because it’s different depending on how you count. It is tempting to jump on these arguments—passionate as we all are for getting the ever-dwindling facts out to our fellow Americans. But doing so will cede the home field advantage to the GOP. This certainty accounts for Stuart Varney’s crowing that it’s about time we get back to talking about how “half of the population is living off of the other half” during Fox and Friends’s morning coverage of the tapes. It is the same reason that Brian Kilmeade on the same network stated unequivocally that Romney should be stumping on this issue all the time. If we’re spending time talking about what half the population does or does not get or do, we inevitably draw attention away from the fact that the GOP is running a candidate whose entire life experience and political vision is shaped by being part of the top tiny fraction of this country’s wealth at a time where most Americans are struggling to get by. So, while the campaign can’t be happy about the GOP-patented guerrilla tactics now coming back to bite one of their own, early pronouncements that the election was won last night are premature and irresponsible. If Romney’s camp can weather this storm and find themselves washed up on the beaches of the 47 percent versus the 99 percent, they might have chance of not getting voted off the Island. This election—and more important, the fight for economic opportunity—remains about the genuine struggles and solutions that benefit all but the most privileged in this country. Romney’s dismissal of half of those folks doesn’t change that fact. A full timeline of the right’s campaign to move the 47 percent meme is provided here by Media Matters for America. For more on Romney and the 47 percent, read John Nichols on how the presidential candidate himself belongs in that number.